Few stories have captured the imagination of successive generations of American children as much as the whimsical nursery rhymes of Mother Goose. Nostalgia for characters like Humpty Dumpty, Little Bo Peep and that athletic cow who jumped over the moon are captured here by Patricia Edmundson. Painted for the Mount Horeb Public Library, this painting speaks to the ability of libraries to transport the imaginations of children into the fantastic, much like the goose ferrying gleeful youth. Plucky little trolls and a heavy robed Nisse greet the children, inviting them to learn the folklore of the town—quite possibly the same stories of their grandparents’ youth. Few stories have captured the imagination of American children across multiple generations as the whimsical nursery rhymes of Mother Goose. The nostalgia for characters like Humpty Dumpty, Little Bo Peep and that athletic cow who jumped over the moon are captured here by Patricia Edmundson. 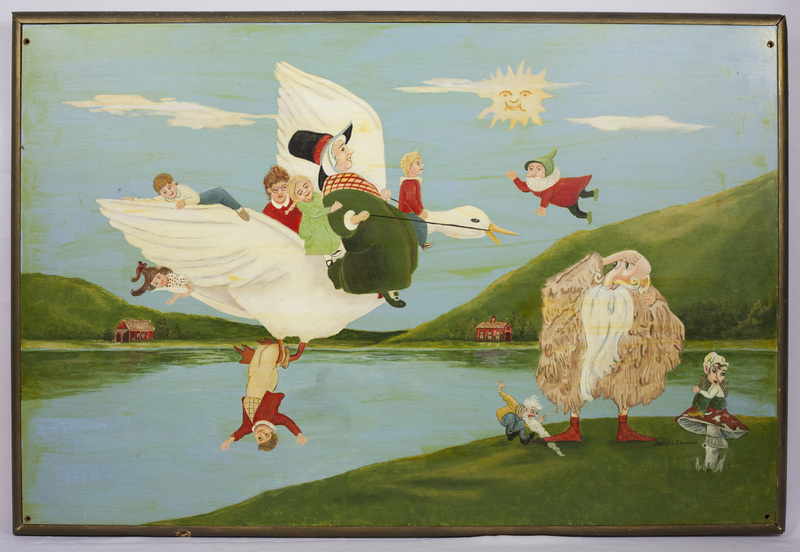 The six children carried by Mother Goose and her larger than life white goose are greeted not by these famous characters; rather, they are met by three trolls and a nisse, figures from Norwegian folklore. The scene painted on this 25¼”x37½” plywood board is one of playful potential on a warm day, note the smiling sun set in the sky. The children appear to be landing along a lake surrounded by hills as Mother Goose tightens the reigns on her feathery ferry. The setting for this rendezvous is reminiscent of the geography of the Driftless Area, bringing together stories and scenery familiar to many of the children in and around Mount Horeb. When Edmundson created this painting sometime between 1978 and 1991 for the Mount Horeb Library, the facility was located in the Village Office along East Main Street and North 2nd Street. Children entering the library, just like those in the painting, these comical folkloric creatures, similarly inviting them to learn the folklore of the town, and possibly the stories of their grandparents’ youth. While the library would later move, the painting remained in the basement of the Office, where it would later be found. Children can still travel to fantastic lands at the Mount Horeb Public Library, located at 105 Perimeter Road on the east side of town near the Norsk Golf Club. While we recommend visiting in the company of friends and family, travel by magical, gigantic goose may be a difficult mode of transport to attain.